So I have recently just fallen for this character and I would love to be in that costume. I can break down parts like the leotard and the large boots. But is that thing a mask? How would be best to make the close cowl/cape? any suggestions. 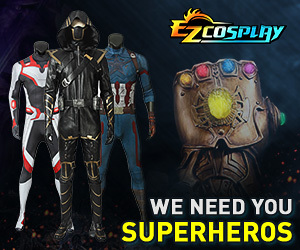 Do you have any idea what kind of material you are going to use for the cowl/cape combo? It's a tricky predicament but what I would do is make the cowl and neck piece separately from the cape and use a hidden zipper or snaps on the underside of the cape to attach the cape to that (I can draw out better than I can explain it). That's just me. Otherwise I would look into using something like latex and doing a molded piece. Hopefully that helps or at least gives you an idea. Maybe you could use [URL="http://www.trendyhalloween.com/Gold-Full-Face-Adult-Mask-P13562.aspx?afid=4&gclid=CIrUq6qL3MACFSdk7AodbWAAXQ#.VBMeKGNdVsg"]a mask like this[/URL] and then line it with stretch gold lame pulled widely enough that you can see through it? This lady made a Weeping Angel cosplay with greyed-out eyes, and what she did was [URL="http://crafty-tardis.livejournal.com/152724.html"]take those plastic cups from vending machines (you know, the ones in movie theatres where you pay 25 cents for a little plastic ring or something and it comes in a plastic bubble) and cut them to fit the eyeholes of a mask, then covered them with grey pantyhose. [/URL] Gold pantyhose might be hard to find, though.